Geoff Thomas is no stranger to uphill struggles. Diagnosed with chronic myeloid leukaemia in the summer of 2003, the former Crystal Palace and England midfielder was given just three months to live. Now, 14 years on, and very much alive and kicking, he’s preparing to lead the first amateur team to ever tackle cycling’s three Grand Tours back-to-back. Or, to put it another way, covering 10,504km in the Giro d’Italia and Tour de France an Vuelta a Espana by riding an average of 167km a day for 63 days. It’s enough to make a shift in the Crystal Palace midfield in the 1990s resemble a walk in the park. Speaking to The Independent from Dusseldorf on the eve of the tour – in between a training ride, a nap and the kind of enormous dinner required when you’re burning 8000 calories a day – Thomas appears relatively relaxed despite the size of the task facing him and four others in the coming weeks. “The only time I cycle is when I or someone I know decides to do something a bit silly – like this, I guess,” he says. “I always leave it too late to prepare but I’m sure I’ll be fine. The problem is that a lot of my mates are really keen cyclists and they’re always up for ridiculous challenges. They used to dread my number coming up on their phone because they knew I would be asking them to do something crazy to raise money – now it’s been reversed!" England manager Gareth Southgate has sent his former Crystal Palace teammate Geoff Thomas a video message of good luck as he reaches the halfway point of the Geoff Thomas 3 Tours Challenge. Thomas, who was capped nine times by England and also represented Wolverhampton Wanderers, Nottingham Forest, Crewe Alexandra and Rochdale is currently halfway through the Giro D’Italia, the first of 3 Grand Tours he will take on this year with four other amateur cyclists. Blood cancer survivor Geoff Thomas, entrepreneur Doug McKinnon, former national chef of the year Hayden Groves, wealth manager James Maltin and chef and motivational speaker Marcus Leach are riding the Giro D’Italia, Le Tour de France and La Vuelta a España consecutively, one day ahead of the professionals. Only 39 professional cyclists and, to date, no amateur team have ever achieved this epic feat in the same calendar year. Each rider will cycle a total of 10,504km in just 63 days of cycling. They have already cycled 1669km, the equivalent of travelling direct from Birmingham Airport to Bialystok, Poland and they still have 52 days to go. The driving force and purpose behind the team is their aim to help blood cancer charity Cure Leukaemia raise an additional £1m in 2017 to fully fund the expansion of the globally significant Centre for Clinical Haematology at the Queen Elizabeth Hospital in Birmingham. This transformational development will double the Centre’s capacity for patients, clinical trials and specialist clinicians. Not only will the expanded Centre immediately save more lives but it will also hasten global progress towards finding effective treatments for all blood cancers within twenty-five years. The £3.2m project has already received over £2m from local government and Cure Leukaemia must raise the additional funds by 31st December 2017. Geoff and the team are able to take on this challenge thanks to the generous donations of the Geoff Thomas Three Tours Challenge sponsors. Chief among these are Crystal Palace and headline partner Farr Vintners, the London-based retailers of the world’s greatest wines. The Farr Vintners Chairman is a Crystal Palace FC shareholder and life-long fan, Stephen Browett. Farr Vintners have donated £100,000 towards the challenge. Further support, has come from the Crystal Palace FC family, who upon hearing of Geoff’s latest challenge, were determined to do their bit to support their former captain and his latest fundraising efforts. Cure Leukaemia is a charity that is particularly close to the heart of many within the Crystal Palace FC family, and for good reason. Geoff Thomas was diagnosed with chronic myeloid leukaemia (CML) in 2003 and, after having his life saved by the charity’s co-founder Professor Charlie Craddock CBE, Geoff has been a staunch fundraiser and Patron ever since. Geoff has completed Le Tour de France on three previous occasions and this year’s instalment, The Three Tours Challenge, will be Geoff’s swansong, in which he will ride further than he has ever done before, to raise as many funds as possible for Cure Leukaemia. 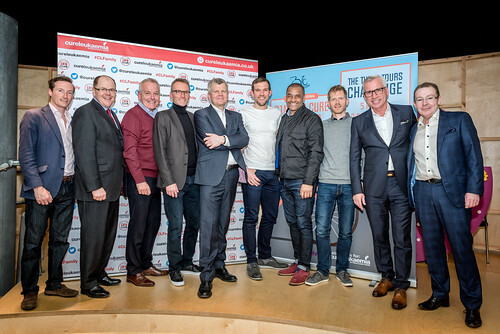 On Thursday May 4th 2017, five amateur cyclists led by former England and Crystal Palace footballer, and blood cancer survivor, Geoff Thomas will begin the Geoff Thomas Three Tours Challenge, a monumental challenge that will see the team cycle the three Grand Tours; the Giro D’Italia, Le Tour de France and La Vuelta a España consecutively, one day ahead of the professionals. Only 39 professional cyclists and, to date, no amateur team have ever achieved this epic feat in the same calendar year. Each rider will cycle a total of 10,504km in just 63 days of cycling. The Farr Vintners Chairman is the former Crystal Palace FC shareholder and life-long fan, Stephen Browett. Farr Vintners have donated £100,000 towards the challenge. Cure Leukaemia is a charity that is particularly close to the heart of many within the Crystal Palace FC family, and for good reason. Geoff Thomas was diagnosed with chronic myeloid leukaemia in 2003 and, after having his life saved by the charity’s co-founder Professor Charlie Craddock CBE, Geoff has been a staunch fundraiser and Patron ever since. Geoff has completed Le Tour de France on three previous occasions and this year’s instalment, The Three Tours Challenge, will be Geoff’s swansong, in which he will ride further than he has ever done before, to raise as many funds as possible for Cure Leukaemia. Joining Geoff in the team are businessman Doug McKinnon, wealth manager James Maltin, chef Hayden Groves and chef and motivational speaker Marcus Leach. These are men with full-time jobs and families who are finding time to train for one of the toughest endurance challenges any person can take on. The team has received messages of support from Olympic royalty in the form of Laura Kenny and Alastair Brownlee and West Bromwich Albion’s goalkeeper Ben Foster, who intends to join the team for the start of the Tour de France prior to the start of the Baggies’ pre-season plans, and from X Factor winner Sam Bailey. For all commercial and media / PR enquiries please contact greg@redmonkeycollective.com.